Dozens charged in major opioid takedown across U.S.
Jerusalem — A tense quiet has taken hold after a night of heavy fire as Israeli aircraft bombed targets across the Gaza Strip and Gaza militants fired rockets into Israel. Schools in southern Israel were shuttered on Tuesday following the violence that erupted just two weeks ahead of Israeli elections. The Israeli military imposed restrictions on public gatherings near the Gaza border after dozens of rockets were fired toward communities in the area, including one that struck a house in the town of Sderot. In retaliation for that the Israeli air force pounded militant sites of Gaza’s Hamas rulers and the smaller Islamic Jihad group. The targets included a multistory building in Gaza City that Israel said had served as a Hamas military intelligence headquarters and the office of Hamas leader Ismail Haniyeh. The airstrike was so powerful it sent debris flying onto the roof of The Associated Press bureau on the 11th floor of a nearby high-rise. Gaza’s Health Ministry said seven Palestinians were wounded in the airstrikes. Israel sent troop reinforcements to the Gaza border and Hamas leaders went into hiding. The Reuters news agency said Israel had sent tanks to the Gaza border. The increased hostilities come at a time when both Netanyahu and his Hamas foes are in desperate situations, with little incentive to de-escalate quickly. Netanyahu is in a tight race for re-election against former army chief Benny Gantz. The prime minister is facing tough criticism from political rivals, including in his own right-wing political camp, who accuse him of being too soft on Hamas. His visit to Washington lent him a boost, however, with President Donald Trump unilaterally recognizing the disputed and strategic Golan Heights, seized by Israel from neighboring Syria in 1967, as Israeli territory. Mr. Trump’s move, which follows the trajectory set by his administration with the unilateral recognition of Jerusalem as Israel’s capital last year, ends decades of U.S. Middle East policy refusing to formally recognize Israel’s land-grab. The U.N. Security Council in a December 1981 resolution called Israel’s annexation of the Golan Heights “null and void and without international legal effect,” and on Monday the U.N. said Secretary-General Antonio Guterres continued to adhere to council resolutions. Syria called the move a “blatant aggression” on its sovereignty, and Lebanon, which Secretary of State Mike Pence visited over the past weekend, said the Golan Heights was “Syrian Arab” territory and that “no country can falsify history by transferring” land from one country to another. Even U.S. allies Canada and Turkey expressed opposition. Hamas, meanwhile, is under growing pressure domestically because of its failure to get Israel and Egypt to ease their Gaza border blockade, imposed after the 2007 Hamas takeover. The Israel-Egyptian blockade, imposed to weaken Hamas, combined with sanctions by the Palestinian Authority and mismanagement by the Hamas government, have fueled an economic crisis that has left Gaza with an unemployment rate above 50 percent. The Monday rocket attack, which caught Israel off guard, may have been an attempt by Hamas to divert attention from its growing domestic woes. Israel and Hamas have fought three wars. Although neither side appears to have an interest in another one, fighting could easily spin out of control. The 2014 conflict lasted 50 days and ended with over 2,000 Palestinian deaths, including hundreds of civilians, and 73 killed on the Israeli side. Monday’s attack came 10 days after rockets were fired from Gaza toward Israel’s densely populated commercial capital of Tel Aviv, and the Israeli military struck back. 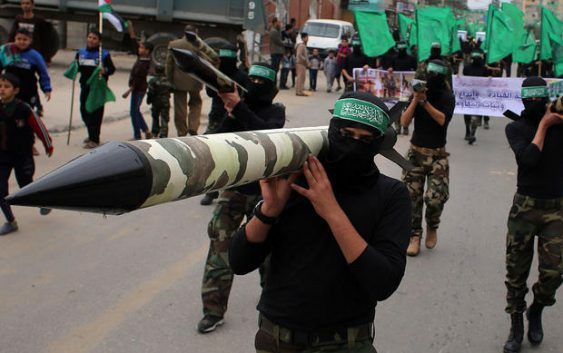 Gaza’s Hamas leaders said the rocket was fired accidentally and the fighting quickly subsided.